Please send any bug reports to support@pep.security. Exit Installation Due to Failure: If an error occurred during installation, the screen below will appear. Please click Finish to exit the installer. If instructions were given (for example to install a newer version of Outlook) please complete them before running the installer again. No compatible version of Outlook was found on your system. : Make sure to install Outlook 2010 or newer. If it is already installed, try to repair it. Then run the p≡p for Outlook installation again. Error during installation If you previously removed p≡p for Outlook and didn’t reboot OS after that, GnuPG instance is still running. 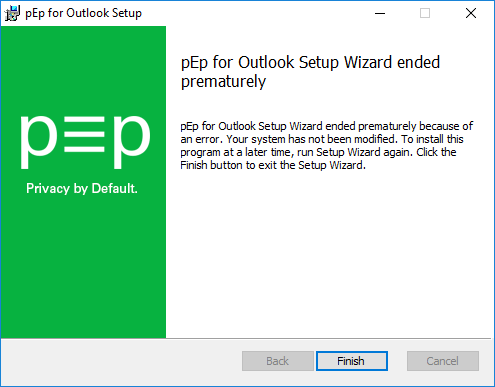 After rebooting OS, you can install p≡p for Outlook again without issues. 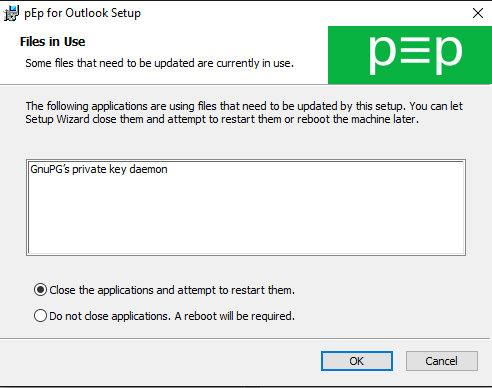 Error during installation If you previously removed p≡p for Outlook and didn’t reboot OS, GnuPG instance is still running. 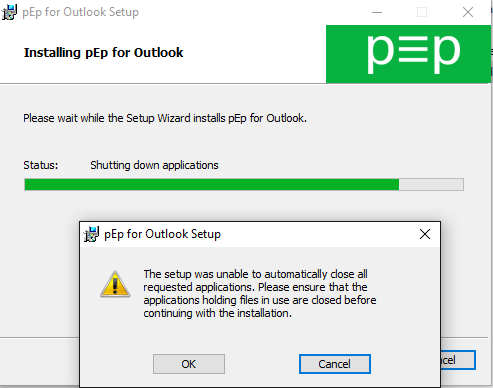 After rebooting OS, you can install p≡p for Outlook again without issues. Error during installation Outlook is currently running. 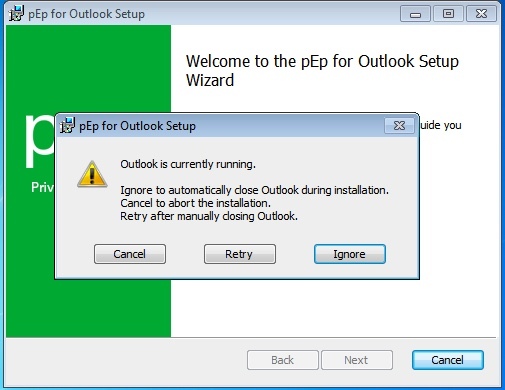 You need to close Outlook in order to install pEp for Outlook. You have 3 options: close it manually (Press Retry button), let the installer close it (Press Ignore button) or abort the installation (Press Cancel button). p≡p for Android offers search only for locally stored messages on the device, it doesn’t work reliably with searching messages on the server at the moment. shared Data Store files (.ost or .pst): In Outlook it is possible to share Data Store files between multiple accounts. This will cause issues in p≡p for Outlook. We suggest to use one Data Store file per account (which is the default in Outlook). Trusted servers are not supported with EAS due to limitations of the protocol. pEpCOMServerAdapter.exe is reported by Qihoo-360 Antivirus as Malware. Generally we suggest not to use another PGP encryption add-on in parallel with p≡p.